The Superfeet Blue insole provides all-purpose performance. 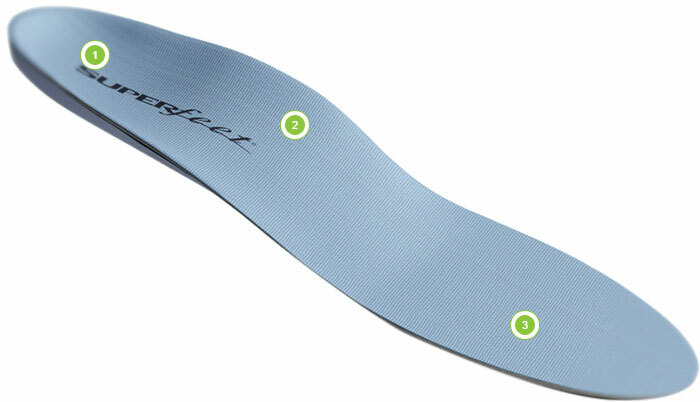 Long-lasting support packed into a thinner, high-performance insole to help improve the fit of a wide range of footwear. Medium-profile insole with the shape that can fit into most footwear while providing intermediate support. Most types of low and medium-volume footwear, even some without removable insoles. Heel Cup - Helps position the heel to naturally absorb impact. Biomechanical Shape - The medium-profile shape puts biomechanical support under your foot, but takes up less space in the shoe. Organic, Odour-Control Coating - All natural coating that inhibits the growth of odour-causing bacteria. Superfeet Blue Insoles is rated 4.7 out of 5 by 27. Rated 5 out of 5 by Johnboy234 from Used for GR20 The stock insoles that came with my Scarpa Vortex shoes compressed very quickly and I needed something for my upcoming trip to Corsica to do the GR20. These fitted straight out the box and were perfect for the job. very comfortable and excellent underfoot support - a must for a trip like this! Rated 5 out of 5 by Nigela from Medium support, great for everyday shoes This product is a classic by Superfeet, and has medium arch support. I had to cut a little to fit in my New balance trainer, but fits like a glove now and is supportive for a "normal" foot. Recommended for someone looking for a bit more support than a standard insole supplied with any trainer. Rated 5 out of 5 by Bristol47 from Benefical for foot and achilles pain This is my second pair of these insoles and I am very pleased with the comfort and support they provide. I walk a 5 mile round trip to work and as a nurse spend much of my day on my feet. By using these insoles I have noticed a significant improvement in the degree of aching and discomfort I experience. I have swapped my first pair between shoes most days and they have not been damaged so they also seem robust. Wiggle are selling these at a great price and I would recommend these to anyone who is needs extra support or is experiencing foot or ankle pain. Rated 5 out of 5 by Whistler45 from Excellent support - low volume insole. I started using Superfeet insoles around ten years ago now, they can take a little time to get familiar with, but for me, I now use the Blue, Green and Carbon in all my foot ware, depending on volume.. It is important to get the size and fit right. UK 10 is an E?? I am a UK 10, does that equate to an E sizing, or should I go with an F? I can confirm that you would need a E if you are UK 10. I hope this helps. UK size 11. Can I buy a size F and cut to size? Yes. These are designed to be cut to the same size as the insoles you're replacing. Which colour do I chose? I have some expensive Mavic Zxellium road shoes that I find really uncomfortable on the arches of my feet in comparison to my entry level Shimano shoes. I really want to wear the Mavics; will these help and which colour insole is appropriate? These would certainly help in terms of re-aligning the foot slightly inside the shoe and providing support around the heel and the underside of the arch close to the heelbone, which should alleviate pressure typically caused by the arch dropping and creating pressure on the foot inside the shoe (pronation). Either the Blue models or the Carbon models (linked below) would fit and work well in the shoes.